This page is about the American M41A1. For the version in the Japanese tree, see M41A1 (Japan). The Light Tank M41A1 Walker Bulldog is a Rank IV American light tank with a battle rating of 6.0 (AB/RB/SB). It was introduced at the same time as the American ground tree in Update 1.45 "Steel Generals". 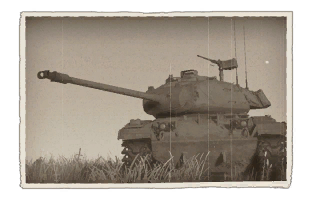 A large improvement over its predecessor, the M24 Chaffee, it features a gun that can more adequately fight the tanks at its tier with an APDS round and has a very good mobility and low profile to move quickly against the enemy. Suspension wheels, bogies, and tracks are 15 mm thick. Tracks are placed on the turret side and rear that can provide about 10 mm of extra armour. An extra 12.7 mm RHA metal plate is present on the right side of the turret near the pintle 7.62 mm machine gun. A 5 mm Structural steel box is present, mounted on the vehicle rear. Ammo rack of the M41A1 Walker Bulldog. Like the tanks that come before it, the Bulldog should be used as a rapid-deployment support vehicle in conjunction with heavier vehicles like the T32. It is best used to run rapid insertion and flanking operations while allowing the heavier tanks absorb the brunt of the enemy attack. The Walker Bulldog works well with M26 Medium tanks as the M26 has a harder hitting gun to support the light tank's advance, but the M41A1 maintain a much better climb rate for hills and a much faster acceleration. The Bulldog's top speed does cap off-road, requiring good knowledge of the map to make the most of the terrain. Top speed of 72 km/h. Respectable firepower when loaded with APDS. APDS has high muzzle velocity, easy to hit targets at longer ranges. Good suspension; can drive away from steep downhills and jumps. .50 cal AA machine gun with good coverage. Low torque, without downhill the tank won't reach higher speeds than 50 km/h. 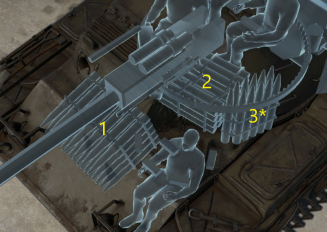 Thin armour, even SPAA tanks will take out the tank given the opportunity. Its poor engine is its biggest weakness, makes it a bad scouting unit. Ammo storage in the front, next to the driver. APDS shot causes only punctual damage (aim carefully). No explosive filler on any AP shells. Quite tall for a light tank. The U.S. Army light tank in the later part of World War II, the M24 Chaffee, was a promising design but was deemed not effective for the future of armour encounters. Though its role as a scout was seen as needing the 75 mm gun, the army wanted a tank with a better gun to have a more equal chance against tanks. The project began as the T37 program in 1947 with the focus of being air-transportable with an anti-tank capability in the form of a 76 mm gun and a rangefinder. The adoption of a simplified rangefinder had the project designation changed to the T41. After testings and evaluations, the T41 model was accepted into service as the M41 Little Bulldog , with production starting at Cadillac Cleveland Tank Plant in 1951. The name Little Bulldog stayed until General Walton Walker, the first commander of the 8th US Army in Korea, died in a car accident, so the tank was renamed into the M41 Walker Bulldog in remembrance. Production went from 1953 to somewhere in the late 1960s with about 3,728 units produced. The M41 light tank would go on to replace the M24 Chaffees by 1953. The M41 had a crew of four, commander, gunner, loader, and driver. The tank had a profile of under 9 feet and 19 feet long. The tank was lightweight at 23.5 tons and thus had rather thin armour, with the front armour only 25.4 mm thick (sloped at 60 degrees for about 50 mm effective). However, the tank was very agile with its torsion bar suspension and Continental AOS 895-3 series 6-cylinder gasoline engine of 500 hp which could deliver a road speed of 45 mph with a 100 miles operating range. Unfortunately, the tank was criticized for being noisy, a fuel-guzzler, rather heavy, and the American crewman found the Bulldog's interior to be quite cramped. Despite that, it delivered speed, firepower, and reliability in a light tank format. 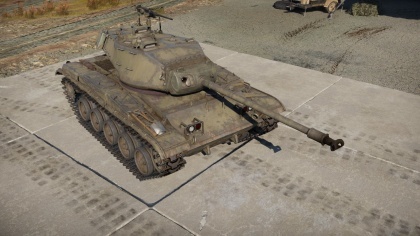 Several upgrades were made on the M41 with better technology, the M41A1 had a hydraulic turret traverse with more ammo storage, the M41A2 had a new fuel system, and the M41A3 are old M41A1 tanks with the new fuel system from the M41A2. The M41 Walker Bulldog first saw use in Korea in a limited combat run. The tanks, still labeled their experimental designation T41, were sent for field testing on design deficiencies. It is unknown what other purposes they served there except for the tests. Their first major conflict once adopted by the U.S. Army was in Vietnam, mainly by replacing the M24 Chaffees in service with the South Vietnamese army (ARVN) at the time. The M41A3 tanks arrived in January 1965 and were instantly popular; not only for their advantages, but the previously cramped interior for American crews were actually perfect fit for the smaller Vietnamese armour crewman. The Bulldog went on to fight in the Vietnam War as a reliable war machine. The Bulldog had an advantage due to its light weight in maneuvering in the jungle terrain of the region. In 1971, Operation Lam Son 719, the disruption of the North Vietnamese Army supply lines had the M41 Bulldogs play a major role, accompanied by two airborne battalions and two cavalry regiments. Penetrating deep into enemy lines, the 17 M41 tanks engaged and destroyed six Soviet designed T-54 tanks and other lighter armoured vehicles. This engagement came at a lost of 5 M41 and 25 armoured personnel carriers. By 1973, the ARVN still used about 200 M41 tanks while the American units transition over to the M48A3 Patton tanks in Europe and Stateside. The M41 light tanks were also exported to various other countries. Today, Guatemala, Somalia, Taiwan, Uruguay, and Vietnam still use the M41 Walker Bulldog, some via upgrading the tanks to extend their service life. The M41 Walker Bulldog design was advanced for the time, giving a relatively light weight tank the firepower to take on other tanks of its time period. The chassis was even used on the M42 Duster Anti-Air gun and the M75 Armored Personnel Carrier. The drive, engine, transmission, and auxiliary engine also were used in the M44/M52 155 howitzer. By 1969, the US Army began replacing the M41 with the newer M551 Sheridan Armored Airborne Reconnaissance Assault Vehicle (officially not a "light tank") which had a 152 mm cannon that could fire shells and anti-tank missiles. The M551 Sheridan could be used in roles that the M41 Walker Bulldog couldn't do, such as be air-dropped and amphibious, but was rather unreliable. This made the M41 Walker Bulldog to be the last American "light tank" produced and the last made before the classification between tank classes based on weight and role ended. This page was last edited on 24 March 2019, at 17:06.